Revegetating damaged landscapes from building, excavation or mining projects can be difficult in Australia’s diverse environment. 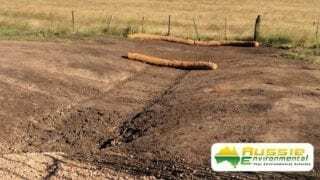 A range of soils, site and tumultuous weather conditions across the country means that there isn’t an ‘all round’ revegetation solution for every site’s rehabilitation and erosion control project. However, there are some widely recognised methods as the most efficient, environmentally friendly and cost-effective solutions for long lasting, healthy revegetation in Australia’s ranging habitat. 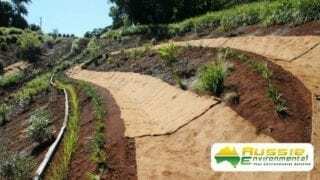 Hydromulching is a fast, effective, economical revegetation strategy for large areas of exposed soil from construction and mining activity; whether the area is flat, hard to access or significantly steep. Hydromulch is a fibre-mulch to the mixture of seed, fertiliser, tackifer and water that is sprayed to exposed areas to generate grass growth. The mulch acts as a cover for the seed, helping it retain moisture for faster germination, while protecting the soil from erosion and the seeds from washing away in the rain. The mulch also consists of soil builders and growth stimulants which act to replenish the topsoil with much needed nutrients and improve the soils ability to support long term growth, all while promoting erosion control and soil stabilisation. The seeding process involves specially designed hydromulching equipment to spray a slurry of water, seed, fertiliser, organic mulch fibres and a binder/tackifier onto the seedbed. A specialised hydromulch machine agitates the hydromulch mixture during application to ensure an even and constant distribution. This results in a more even application of the mix which protects the soil surface from erosion and also promotes faster, more unified seed germination for grass growth. 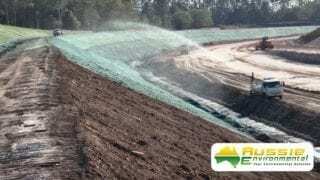 Hydromulching is an effective solution for erosion control and stabilisation of road side batters, soil stockpiles, long term dust suppression, mine site rehabilitation and remediation of large industrial areas. It is recommended to conduct an on-site soil analysis to best determine the custom blend of ingredients that will give your site the best chance of revegetation success. Determining which plant growth medium products best suit your site’s conditions and meet your project’s requirements is essential to their efficacy and sustainability. 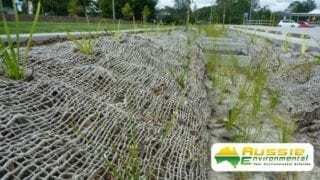 In land development, erosion control is important. Aside from preventing water pollution due to runoff and the potential habitat loss of nearby ecosystems, erosion control also staves off soil loss and consequently, property loss. In urban areas, erosion control techniques are primarily concerned with storm-water runoff management, however soil loss due to winds and sloped properties must be considered as well. As a landscaping solution, Erosion Control Blankets help provide soil erosion protection and assist in the establishment of vegetation to help protect slopes, or low-flow channel applications and drainage areas. Jute Mesh, Jute Matting, Coir Mesh and Coir Blankets are all biodegradable blankets that are installed to protect exposed areas from water and wind whilst vegetation is re-established. Open weave blankets such as Jute Mesh and Coir Mesh are most commonly used in bioretention basins and swale drains, pinned over a layer of mulch to protect plants and help the vegetation re-establish. Whilst Jute Matting & Coir Blankets are blankets commonly used on exposed batters and slopes to provide a form of erosion control protection and weed suppression to disturbed soil, until vegetation takes hold. 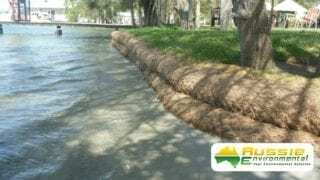 Coir Logs are another biodegradable erosion control product that is ideal for stabilising hills, banks, shorelines, and other erosion prone areas. Easy to install, coir logs create a natural control area that helps manage stream flow velocity and prevent scouring and soil loss on slopes and in gullies. Coir logs are commonly used in open drains found along roads where they are used to capture sediments and slow water runoff. They are also used to stabilise shorelines and embankments whilst providing a natural wall of protection for plants and soil. 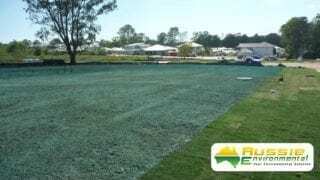 Aussie Environmental provides Hydromulching services across South East Queensland and supplies Erosion Control Blankets & Coir Logs Australia wide.